Gregory Cecil has a nice piece today in Spaceflight Insider on symbolism and the first moon landing, commemorating the 46th anniversary of launch of Apollo 11. 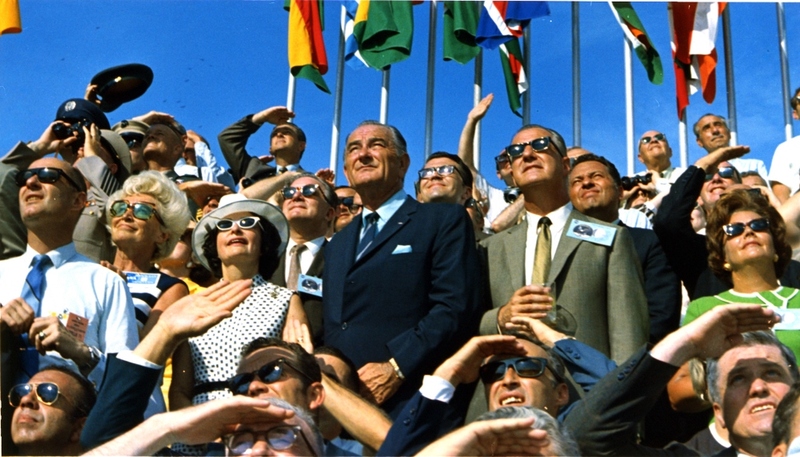 The second shows Johnson and Agnew amidst a sea of 20,000 VIPs watching the launch. Flags of various countries (representing the nationalities of the VIPs?) fly in the background. 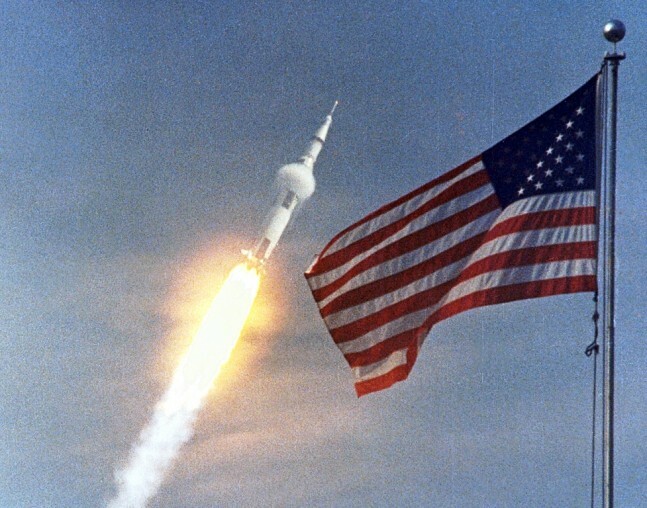 Apollo 11 was both an amazing achievement of the United States, and of humankind. 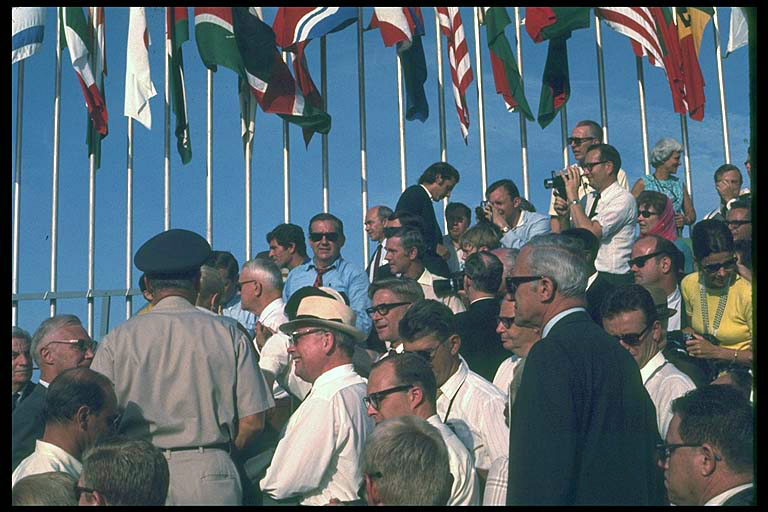 The tension between the two is nicely illustrated by the two NASA photos, one a fabricated image of Old Glory and rocket, the other of the multinational audience marked by flags of many nations. Unknown to most of the public, a debate had raged prior to the launch about which flag was to be planted on the Moon during the mission. Some had argued behind the scenes that since the crew ofApollo 11 was representing all of humanity, a world flag, such as the United Nations flag, should be planted on the Moon during the landing. Others argued that since it was an American venture, the United States flag should be planted. 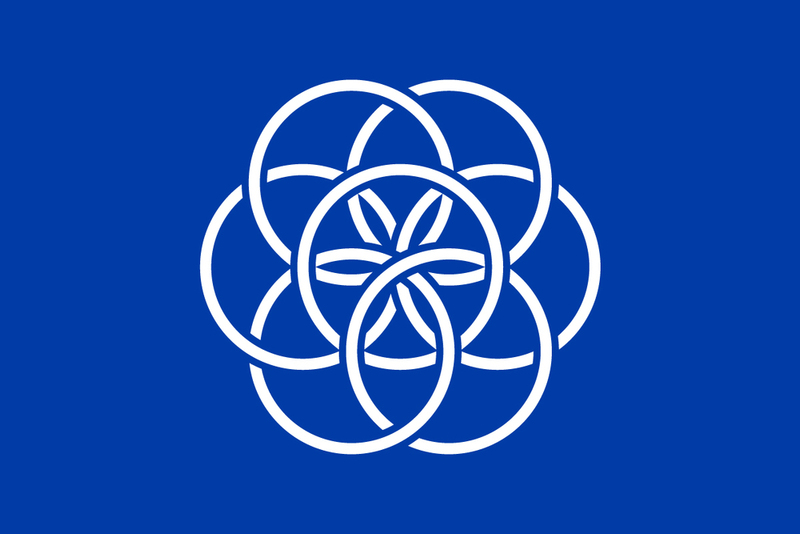 The reason this was such a controversy was that, in the past, the “planting of the flag” indicated taking possession of a land or territory which, in this case, was in direct violation of the 1967 United Nations Treaty on Principles Governing Activities of States in the Exploration and Use of Outer Space, including the Moon and Other Celestial Bodies (commonly known as the Outer Space Treaty). NASA, in February of 1969, set up a Committee on Symbolic Activities for the First Lunar Landing to study the issue. The decision was made to use the United States Flag and have a plaque showing both hemispheres of the Earth representing all of mankind. The night before the launch, a team from Marshall Space Flight Center led by Jack Kinzler attached the flag and plaque to the Lunar Module Eagle. I really believe that if the political leaders of the world could see their planet from a distance of 100,000 miles, their outlook could be fundamentally changed. That all-important border would be invisible, that noisy argument silenced. The tiny globe would continue to turn, serenely ignoring its subdivisions, presenting a unified façade that would cry out for unified understanding, for homogeneous treatment. The Earth must become as it appears: blue and white, not capitalist or Communist; blue and white, not rich or poor; blue and white, not envious or envied.